In Full Contact Fighting Against all Styles. Depicted below is the United States World Tournament Team for 1996. Seated in front are the President, General Chen, and Vice President, General Wu of the International Chinese Kuoshu Federatioin, based in Taiwan, the site of the 8th Annual World Tournament. Also seated are the United States Team Leader Grandmaster Huang Chien Liang, Men’s Head Coach Shr Fu Mike Patterson and the Women’s Head Coach Shr Fu Richard Lee, the Assistant Coach Shr Fu Kevin Preston and the Team Manager Andrea Cheng. The United States Team placed third overall in the World competition among fifty countries competing. The U.S. came away with three World Champions in the Full Contact fighting events: Alexander Sphigel, Dwayne Harrell and Maria Munayer. Two third place finishes: Mario Mancini and Bob Reynolds. Two fourth place finishes: Norma Futini and Joan Murakami. Also, one Gold, one Silver, one Bronze, and two fourth place finishes in the empty hand, weapons and two person forms competitions. The contests are three rounds of three minutes continuous fighting with a one minute break between rounds. Sometimes the preliminary bouts will be a reduced round length, depending on the promoter of each respective tournament. The contests are fought on a platform ranging currently from two to three feet high, and twenty four by twenty four feet square. Three points awarded for execution of a technique, whether strike or throw, that succeeds in ejecting the opponent off the platform entirely. Currently, the safety gear worn consists of a "head cage" (basically a boxing head guard with a cross hatch of a few plastic bars on the front to protect the nose), fingerless 4 oz. gloves and a groin cup (women also wear breast protectors). No taping of the hands or feet, and no padding of the feet or shins is permitted. The contests are open to all styles and backgrounds. Classes are according to weight only. To compete in the World tournaments (held every four years), you must demonstrate actual ability in both empty hands and weapons of a Chinese persuasion. This requirement is waived for other events. 1st Place Lei Tai fighting = 5 pts. 1st Place Lei Tai fighting = 3 pts. 1st Place Lei Tai fighting = 2 pts. 1st Place Lei Tai fighting = 1 pt. 1st Place forms competition = 3 pts. 1st Place forms competition = 2 pts. 1st Place forms competition = 1 pt. 1st Place forms competition = 1/2 pt. In this way, it becomes possible to win an overall place even though a team may not have had the greatest number of first place finishes (although it certainly helps go along way). 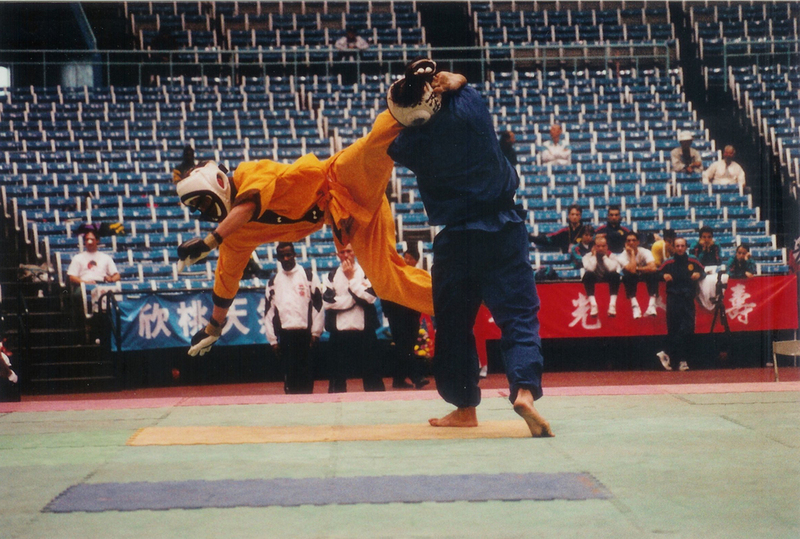 Prior to 1998, this was an overall compilation from both fighting and forms competition events. But, in 1998 the fighting and forms competitions were separated into two different awards. The following is a listing of accomplishments of Shr Fu Mike Patterson’s Chinese KuoShu Full Contact Teams, since his re-involvement in such training in 1994. All of places depicted below were achieved in World, International, National and Regional Full Contact forums open to all styles and ranks. 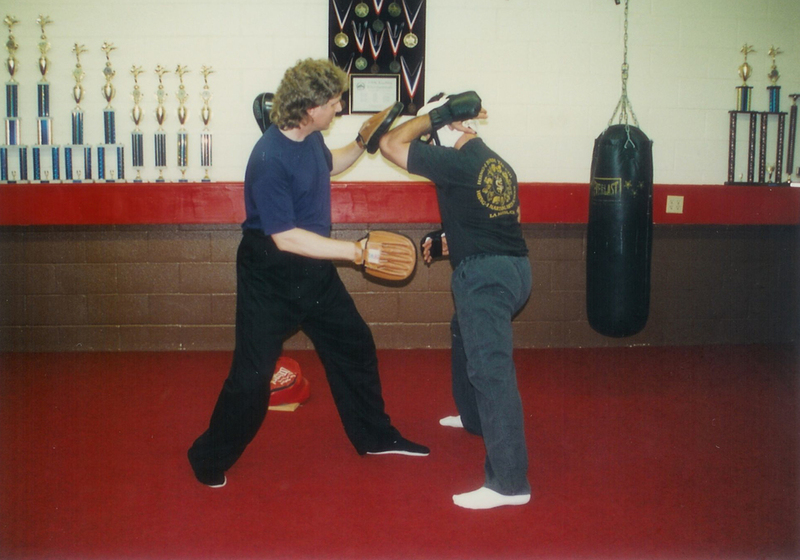 The fighters are hand picked students of Shr Fu Patterson and are trained in Classical Hsing I Chuan. Some of them also have Pa Kua and Chen Style Tai Chi training under Shr Fu Patterson as well. We wanted to let people know that the Internal Arts are dynamic and effective fighting systems! As they are well known for in Asia... This, in addition to having tremendous health benefits to the practitioners involved with their study. Five of the below individuals qualified for a seat on the 2000 U.S. World Team which was not held due to a change of political party in Taiwan in the 2000 elections. They were: Alex Shpigel, Mario Mancini, Step Taylor, Ali Cheng and Cathy Reedy. 3rd in the Intermediate Hsing-I Division. Six of the ten U.S. Men came from this Institution. They were: Alex Shpigel, Mario Mancini, Steve Cotter, J.P. Hickman, Doug Gargaro and Bob Reynolds. Of the above men, the following three won medals.